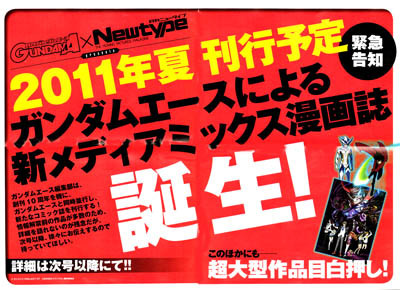 The June issue of Kadokawa Shoten's Monthly Gundam Ace magazine is announcing on Tuesday that Gundam Ace and another Kadokawa magazine, Monthly Newtype, are collaborating this summer on a new manga magazine. The magazine will feature tie-in manga for franchises in other media, and the announcement features images from Sunrise's upcoming Sacred Seven television anime series and Bones' upcoming Towa no Quon anime film series. 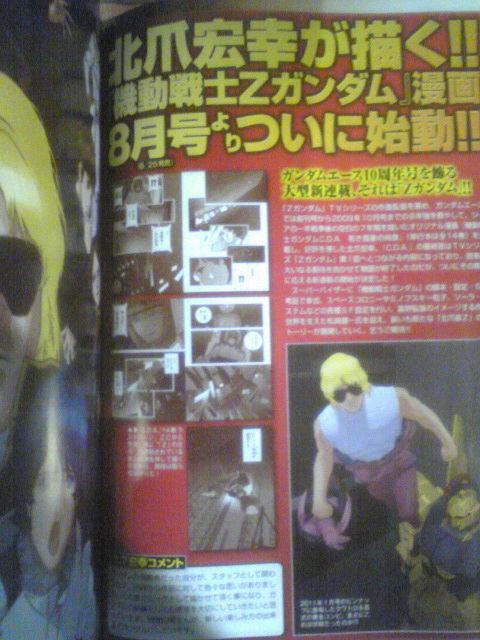 More details will be provided in the next issue of Monthly Gundam Ace . The June issue of Monthly Gundam Ace is also announcing that creator Hiroyuki Kitazume is drawing a new manga adaptation of Yoshiyuki Tomino and Sunrise's Mobile Suit Z Gundam robot anime series in the next issue in June. Kitazume had worked as an animation director on the Z Gundam television series, and then he designed the characters in the Mobile Suit Gundam ZZ and Mobile Suit Gundam: Char's Counterattack sequels. Kenichi Matsuzaki, the scriptwriter who was responsible for the first Gundam series' scripts, setting, and science-fiction research, is acting as the supervisor of the new manga. Matsuzaki is credited with Gundam's version of space colonies (based on physicist Gerard K. O'Neill's original concepts), Minovsky particle, and Solar System weapon. Kitazume had previously drawn the Mobile Suit Gundam: Char's Deleted Affair ~ Portrait of Young Comet manga in Gundam Ace from the magazine's inaugural issue in 2001 to 2009. The character designer of the first Gundam series, Yoshikazu Yasuhiko, has also been drawing his Mobile Suit Gundam: The Origin re-imagining of the first Gundam story since Gundam Ace's inaugural issue. The magazine happens to be celebrating its 10th anniversary in June. Update: Z Gundam manga's launch month corrected. Thanks, Deacon Blues.